When it comes to shellfish, the lobster is an American favorite. It is revered as luxury seafood, loved by many for its pure quality and buttery flavor. Cooking the meat requires a culinary dance to produce the light, almost airy taste that your diners love about lobster dishes. The lobster tail, which makes up 33% of the body weight, yields the prized meat of this scrumptious crustacean. There are many ways to cook a lobster and all of them run the risk of overcooking and toughening the meat. An attentive chef is needed to master the lobster and bring out its full potential as a favorite item on your menu. To seal in flavor and moisture, many cooks prefer steaming or boiling with gentle heat. Broiling and baking make for a perfect meal as well, but these methods run a higher risk of drying out the precious meat. When prepared properly, the lobster will drive your diners wild with seafood enthusiasm. 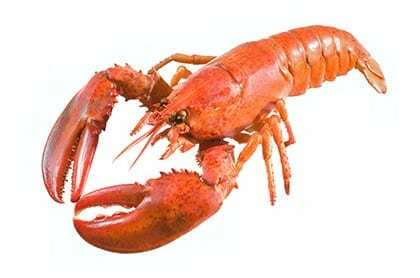 Since lobster are so valued by seafood consumers, they are highly sought after by fisheries. Since lobsters are long-lived and slow to mature, they are vulnerable to overfishing. Populations of both spiny and American lobsters have been depleted in some areas. However, effective management has taken hold of many of these fisheries and has maintained healthy populations. Stock assessments in these areas have shown lobster numbers to be increasing. There is some concern over bycatch from traps, but otherwise there is very little environmental impact. Pucci Foods is proud to offer high quality succulent lobster to Bay Area businesses and residents. We enjoy providing sustainable seafood for our clients and hope that you will choose us to provide wholesale lobster for your customers. Get in touch with us today to order your wholesale lobster by filling out the form on this page.